The clock is ticking for President Trump and his trade team to strike a new deal with Mexico and Canada. 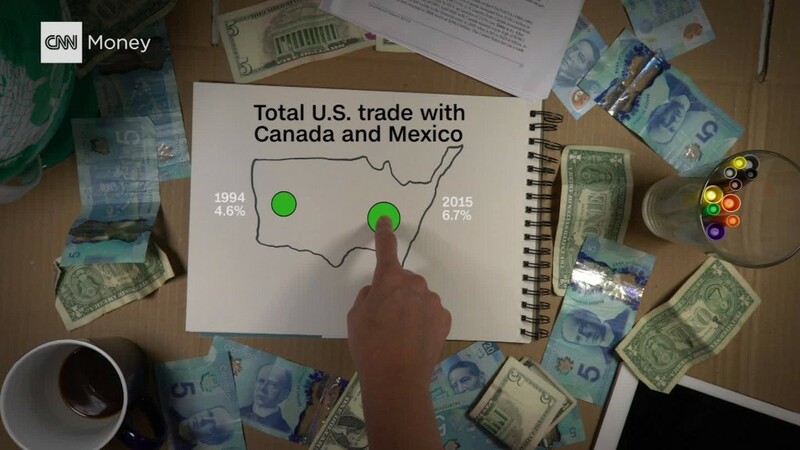 Round four of the renegotiation of NAFTA, the three-nation trade pact, begins Wednesday, and little, if any, progress on the thorny issues has been reported from any party. Some business groups are becoming extremely concerned about Trump's agenda. "There are several poison pill proposals still on the table that could doom the entire deal," Tom Donohue, CEO of the U.S. Chamber of Commerce, said in a speech in Mexico City on Tuesday. The Trump administration did not respond specifically to Donohue's remark, but had already criticized a similar comment from the Chamber last week regarding NAFTA talks. "The President has been clear that NAFTA has been a disaster for many Americans, and achieving his objectives requires substantial change. These changes of course will be opposed by entrenched Washington lobbyists and trade associations," U.S. Trade Representative spokeswoman Emily Davis said. Time to reach an agreement is running out: Mexican leaders have long warned that talks must end by early next year before their presidential election campaign gets underway in July. By the spring, they say, it'll be too difficult politically to ratify a new trade deal. U.S. leaders acknowledge that talks should get done as soon as possible. But some of the Trump administration's demands aren't going over smoothly. Related: Is Trump trying to start a trade war with Canada? One of the most controversial issues has to do with how cars are manufactured. In NAFTA, it's called "rules of origin." The rule determines the portion of a product that must be manufactured in North America in order to avoid import taxes. For example, at least 62% of the parts in a car sold in North America must come from the region to avoid being hit with taxes at the border. It doesn't matter if the car parts are made in Mexico, Canada or the U.S., as long as they were produced in North America. Companies are still free to decide where in North America different parts of a car are made. In fact, before a car reaches a dealership, its parts have frequently crossed the northern and southern borders multiple times. But Trump's trade team wants to make a big change to that rule in an attempt to force manufacturing companies to create more jobs in the United States. Instead of one rule for all of North America, the administration wants one rule for how much has to be produced in the United States, and another rule for how much needs to come from the entire region. "You're pitting the countries against each other, not integrating them further," says Doreen Edelman, a trade lawyer at the firm Baker Donelson. "It is a deal breaker." Mexico's top negotiator, Economy Secretary Ildefonso Guajardo, echoes a similar sentiment. In an interview with CNNMoney in April, he dismissed the idea of two separate standards for rules of origin. "There is no one trade agreement in the world that has country-specific content. It doesn't exist," Guajardo said. "Content has to be measured regionally." Meanwhile, significant issues, such as agriculture trade, government procurement contracts and protecting foreign investments in North America, need to be broached. A deeply divided trade spat over aviation has also emerged between the U.S. and Canada, with each side lobbying for their respective plane producers. The U.S. is also advocating for a "sunset clause" that would make the agreement expire every five years unless each country decided to sign on for another five years. That's expected to meet resistance too. "What kind of predictability is that for long-term investment?" adds Edelman, the trade lawyer. "There's no way for business to prepare."